Perfect Mickey Mouse Cupcakes For A Disney Birthday Party! Have a Disney fan celebrating a birthday or special occasion? 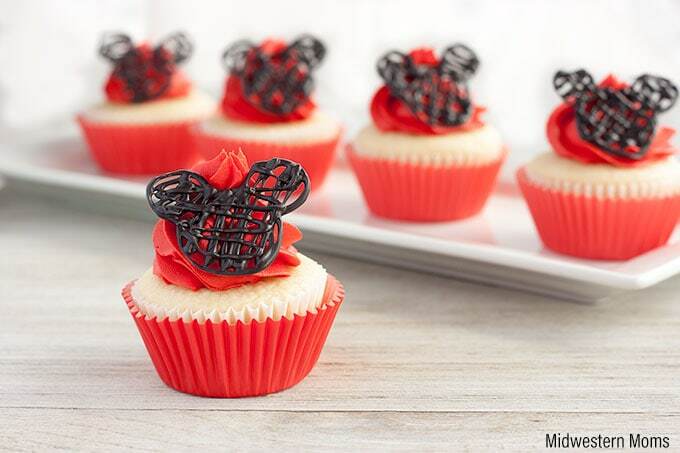 These Easy Mickey Mouse Cupcakes are the perfect cupcake idea for any age! These easy cupcakes use my doctored up cake mix recipe. Since it is doctored, you can get a lot more cupcakes out of one box of cake mix! Score! The cupcakes also turn out so moist and delicious, it really is the only way I make cupcakes nowadays! 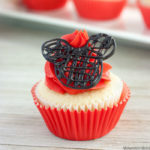 To make the cute little Mickey Mouse symbols on top of the cupcakes, I used black candy melts. 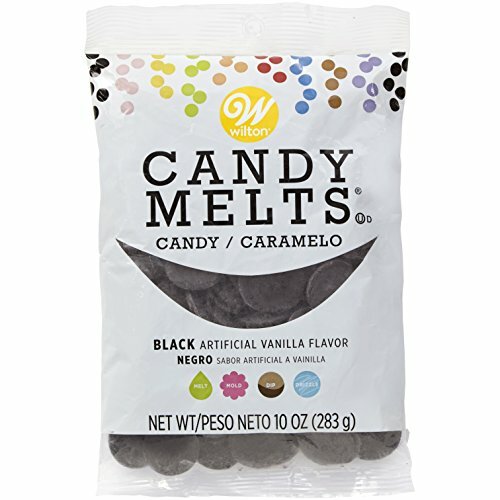 However, dark chocolate would be great too! The first thing you need to do is find a Mickey Mouse shape you like in about the size you want for your cupcakes. Then print it out. 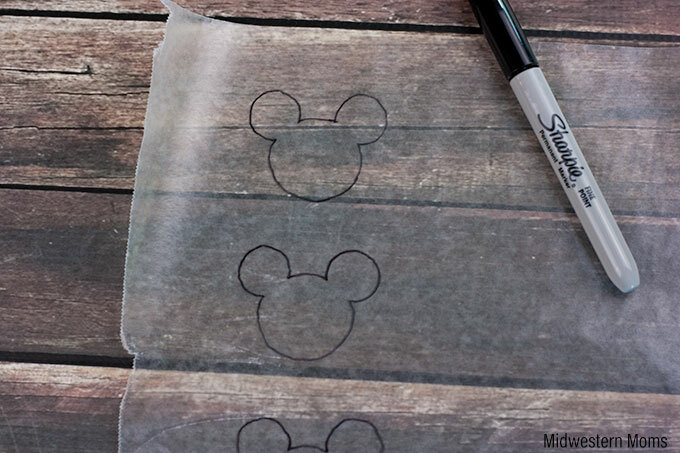 Trace the shape onto wax paper with a Sharpie in the amount that you will need. It may be best to make more than needed, just in case. After tracing, flip the wax paper over so the Sharpie side is down and place it on a cookie sheet. Melt the back candy melts according to the instructions and put the melted candy into a piping bag. Snip the end so you can pipe the candy onto the wax paper. Pipe the candy following the outline of the Mickey shape. Then simply make lines within the shape in zigzag pattern. If you want to make them solid, fill in the Mickey shape completely. After finishing all the shapes, place the cookie sheet into the fridge for about 30 minutes to harden. Meanwhile, you can be making your buttercream icing. I use icing coloring gel to make the red. Make sure you get the no taste red! After piping icing onto the cupcakes, gently press a Mickey shape onto the icing. Do this before the buttercream sets up. 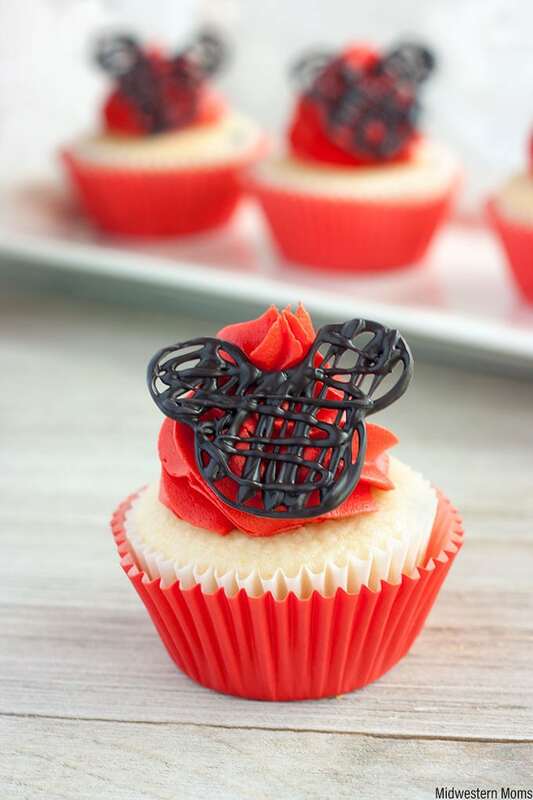 Perfect Mickey Mouse cupcake idea for Disney lovers of any age! Perfect Mickey Mouse cupcakes for any age! 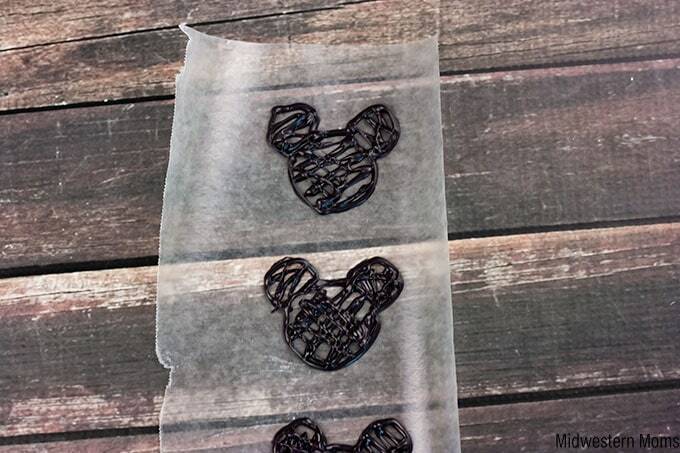 See post for written instructions for making the Mickey Shapes. Add the Mickey Shapes onto the cupcakes while applying the icing.